NEVILLE TWP., Pa. — Two third-period power play goals and a penalty kill that thwarted all four opportunities helped push the Sacred Heart Pioneers past the Robert Morris Colonials 6-2 on Friday night at the Robert Morris Island Sports Center. The score wasn’t representative of the game, as the shots and scoring chances were on the side of the Colonials through the first 40 minutes of play. Two goals from two players both helped give the Pioneers momentum at the start and sealed the Colonials fate later- Vito Bavaro’s two early first period goals put the Colonials in an early hole, beating starting Colonials net minder Francis Marotte first at 2:28 when he stuffed home a rebound and then again at 5:35 for his sixth and seventh goals of the season respectively. The goals didn’t seem to put Robert Morris on their heels though as they went to work, putting up a solid push back for the rest of the first period, outshooting the Pioneers 13-10. Sacred Heart forward Austin McIlmurray then helped salt the game away with two quick strikes in the middle of the third period to put the game away- the first of which came on a power play with the Colonials within striking distance. Following the second Pioneers goal, the Colonials created momentum, battling for loose pucks and spending time on extended shifts in the Sacred Heart end. Luke Lynch cut the Pioneer lead in half with a goal at 17:20 of the first, followed by freshman Aidan Spellacy’s re-direct of an Alex Robert pass at 11:10 of the second. The Colonials struggled to gain the lead, failing to score on three power play chances. Pioneer forward Matt Tugnutt gave his side the lead for good, poking in a rebound from a McIlmurray shot at 15:01 of the second period. 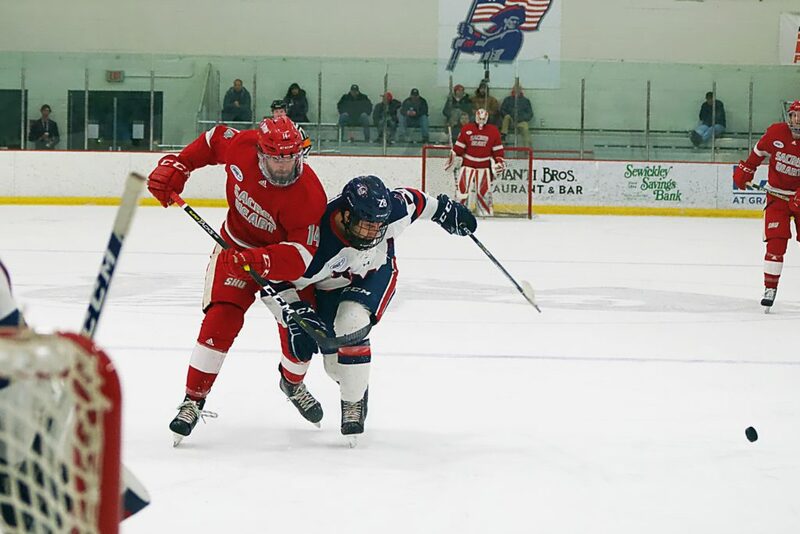 The wheels simply came off for the Colonials in the third period as Sacred Heart pounced on three opportunities en-route to the win. The teams conclude their weekend series Saturday afternoon at the Robert Morris Island Sports Center at 4:05 p.m.